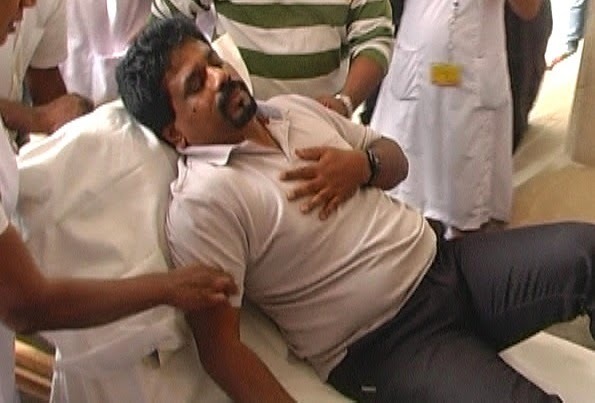 The leader of the JVP Anura Kumara Dissanayake, who met with a road accident, was admitted to the Accident Ward of the National Hospital in Colombo on Monday afternoon. Hospital Director. Dr. Anil Jasinghe said MP Dissanayake sustained minor wounds and that his condition was not serious. The accident occurred at about 11:40 on the morning of Monday, July 28 in the Holipitiya area in Ratnapura. MP Anura Kumara Dissanayake was admitted tot he Ratnapura General Hospital and later transferred to the National Hospital in Colombo. The police say the accident occurred when the pick up truck carrying the JVP leader, had overtaken a tipper and had collided with an oncoming tipper while travelling from Panadura to Ratnapura. The driver of the pick up truck who sustained minor injuries in the incident, was also admitted to the Colombo National Hospital.